This question comes up often. To be honest, even after my training in genetic counseling, I’ve had to Google the difference between these terms not just once, but multiple times. So why am I writing an article about it? Because I still haven’t found a clear answer and chances are, neither have you. Although my colleagues and I have been surrounded by genetics texts and articles for many years, it’s a question that still plagues us. Many of us have seen these terms used interchangeably. “Tomato, tomahto,” right? Is it a matter of preference? Maybe it has to do with the desired meaning or the audience that the user has in mind. But in the world of medical writing, like in all worlds, words matter. When I first set out to write this piece, I had every intention of determining the distinctions once and for all. But, as these lofty goals sometimes go, the answer wasn’t as clear as I had hoped. So, what did I find? According to Merriam-Webster, a disease is a “condition of the body or one of its parts that impairs normal functioning and is typically manifested by distinguishing signs and symptoms.” It can also be described as a condition that affects a physical system. For example, kidney disease affects the way the renal (kidney) system usually works. This can cause symptoms such as fatigue, feeling cold, shortness of breath, and swelling of the hands, feet, and sometimes the face. A bit broader in definition, the word condition is defined by Merriam-Webster as “an abnormal state of health that interferes with normal or regular feelings of health and wellbeing.” Interestingly, the word condition can also be used to describe a state of being in general, regardless of whether you’re referring to a person being well or ill.
To muddy the waters a bit more, let’s look at the definition for disorder. Merriam-Webster defines it as “an abnormal physical or mental condition.” Are you confused yet? By definition alone, there appears to be substantial overlap. Each definition uses the word “condition” in it, for example. Because of this, it led me to believe that how the words are used is more strongly determined by a writer’s preference and how they mean for it to be understood. To further explore this, I asked colleagues at the Emory Lysosomal Storage Disease Center for their opinion. After all, the center has “disease” in its name. For the most part, people seemed to believe that they used the terms to reflect the audience and their method of communicating. If they were speaking to a patient or writing for a general audience, they might use the term “condition.” They might use the word “disease” if they felt a patient perhaps wasn’t fully understanding the severity of the discussion. Generally, they agreed that “disease” and “disorder” could be used interchangeably. They also widely felt that “disorder” tended to have a more negative connotation, or had its roots in mental illness. In general, I noticed a tendency for us in the medical field to stray away from words such as “disease” and “disorder,” which we felt had a negative connotation. 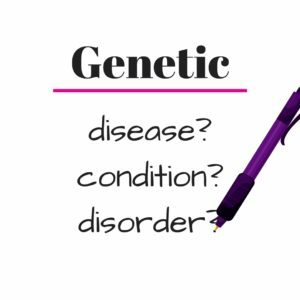 However, many advocacy groups and parents of children with genetic conditions prefer terms like “disease.” They might argue that by using “condition” or “disorder,” we’re downplaying the effect that genetic diseases have on their daily lives. That we’re not using “serious” enough language to capture their experience. Whether physically, mentally, or behaviorally, genetic diseases can have a lasting impact. I know that ThinkGenetic considered this before deciding on the language to use on ThinkGenetic.com and in its communications — and those words may change, depending on the situation. 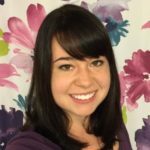 ThinkGenetic’s team of genetic counselors and medical writers naturally approaches content from a medical standpoint, but feedback from patient advocacy partners is critical and shapes it. For example, that’s why you see “disease” used more frequently on the website, yet “Genetic Condition Awareness” updates are posted weekly on ThinkGenetic’s social media channels to be more inclusive to that community. Maybe this is a similar situation to advocacy groups in the 1980s encouraging the use of “people-first language” to avoid the unintentional dehumanization of those with disabilities. (If you’re not familiar with people-first language, an example would be to say, “a woman with diabetes” as opposed to “a diabetic woman”? So, I’m shifting my goal for this article. Rather than trying to establish a clear-cut definition for these terms, I’m hoping to bring to light perhaps a bigger idea that there is no one-size-fits-all solution. Each of these terms does have multiple meanings, so for now those using them and hearing them need to keep that in mind. Whether you call it a “disease,” “disorder,” or “condition,” at least one thing’s for sure – all these words often share a common goal: prevent them, manage them, treat them and/or find a cure. But, what do you think? Do you consider these words interchangeable, or do you think there are differences? Leave a comment to let us know! Source: Merriam-Webster, Incorporated. (2017). Merriam-Webster Medical Dictionary. Retrieved August 21, 2017 from Merriam-Webster.com. Oboy. Being born with a defective gene, I think of it as a condition that I have to live with all my life which may cause system failures or diseases that need to be treated. Hey, Dave! Thank you so much for sharing your thoughts on this! most people I know don’t like disease as they feel people believe it to be contagious! Thanks for sharing, Vanessa! I’ve also spoken with people who believe that all diseases are contagious whether genetic or not. I think the word “disease” has a negative affect on those who are unaware or don’t fully understand about the particular ‘condition’. I tend to use the word “disorder” because in my daughter’s case – an enzyme isn’t not functioning properly – thus I think the word “disorder” fits better than “disease”. Hey, Kathy! Thank you for sharing your experience with us! I like to use the word disease, because that more clearly expresses what it really is. I have to live with the misconceptions that people have, however, that I am going to die tomorrow just because I have a significant disease. Hi, Vera! Thank you for sharing your opinion – it certainly seems as though everyone has a different preference based on their experience!